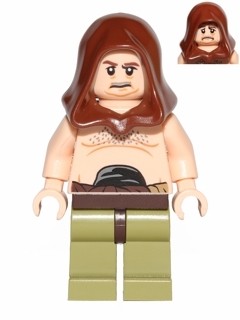 Malakili is a Star Wars minifigure released in 2013. He is exclusive to the set 75005 Rancor Pit. The figure wears a brown hood and green legs, and features a new face. Also new is his torso, displaying skin printing on each side. Malakili was a human from Corellia. He was a servant of the Jabba the Hutt and took care of Jabba's Rancor in Jabba's Palace on Tatooine. He had an emotional and sentimental attachment to the Rancor and cried when Luke killed it. He appeared in The Palawan Menace and was flung through the air by the Rancor on Tatooine. This page was last edited on 10 August 2016, at 10:51.